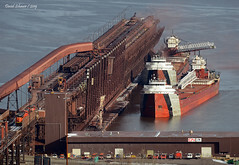 CN's Roger Blough ties up on the east side of Dock 6 (rare) to wait for Interlake's James R Barker to finish loading. 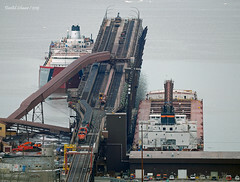 If you look close you can see the trappers dumping cars into dock. Bomb Cyclone, Snowmageddon,Snowpocalypse, Snowzilla, or whatever else they call it, it's still just an old fashioned snowstorm and this April snowstorm continues while a U791 from Minntac glides through Biwabik. Horses of a different color. 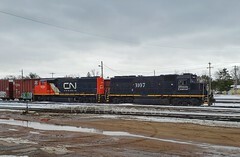 IC 3107 has a new companion to switch with at Stevens Point WI. Also taken in April 2003, DMIR 307 leads the Keenan Switch from its namesake north through Iron Jct. The "regular" ore cars were being used for Blast Furnace Trim loading out of Minntac and back then these moves were handled by the Keenan Switch. 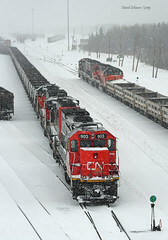 Amazingly some of these same ore cars, built in the 1940s, are still used today by CN on the BFT moves. 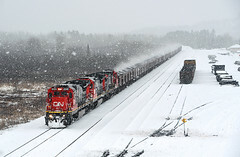 These seasonal moves have been handled in dedicated trains out of Two Harbors for the last several years and should be starting up again soon here in 2019. 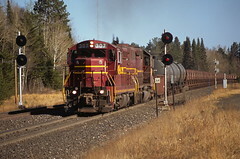 The lead SD-M 307 would not be one of the 5 SD-Ms that CN reactivated for the United Taconite reopening in late 2004. When the Missabe lost half of their tonnage with Evtac's closing in May 2003, it was of several units stored. It was retired by the Missabe in September 2003 and later sold to Larry's Truck & Electric. 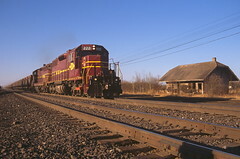 With DM&IR 316 in the lead and the train now loaded, the same Evtac T-Bird winds through the curves between Wolf and Iron Jct., MN in April 2003. Back 16 years ago there was no loop into Largo/Thunderbird so you would get a different leader if you shot both the same empty and loaded T-Bird. The lead SD-M would be saved 5 years later and survives at the Lake Superior Railroad Museum in Duluth. Sixteen years ago this month, DMIR 222 and 316 hustle an empty T-Bird past the Forbes, MN depot at MP 60 of the Missabe Division. The impending closure of Evtac had me up on the Range early on this April 2003 Sunday. The same DM&IR 222 would end up leading the last T-Bird to load at Evtac the following month. Time was not only running out for Evtac but also for the Missabe. 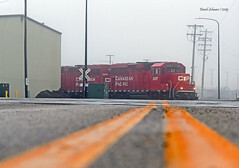 In October 2003, CN would announce the purchase of Great Lakes Transportation and the Missabe would become a fallen flag a little more than a year after this photo. Of course, Evtac would reopen as United Taconite in late 2004 and CN still runs the T-Birds on the Range. The T-Birds and trailing 316 survive, but the 222 and depot not so much. The former J SD38DC would be stored in August 2003 at Proctor with the loss of Evtac traffic and would be scrapped there before the CN takeover. The Forbes depot would last longer, long enough to be seen beside the CN Dash 8s that now reside on the T-Birds, but it would eventually burn down in 2012. What is probably our last significant snow of the year covered up the browns of spring, but of course this is Minnesota, so we could still get a decent snow storm.